Christmas time… Mistletoe and, if the rumours are to be believed, also wine. A big guy in red is gonna break into your house and leave stuff there. And you’re going to be pleased about it. Christmas is weird, is my point. That’s technically two questions, but it’s season of goodwill to all men, so I’ll let it slide this time. Just watch yourself. You’re skating on thin ice here – in this department we do things by the book. Thanks, M. Also – loving the hat. Strong effort. The final day that couriers will take stuff for guaranteed delivery before Christmas (if you’re not called Amazon, Tesco, or something similar) is Friday 18th December (yes, that is today). So we’re sending out the last few bits today and then shutting the presses down for the year. The grand re-opening is January 4th, which is when the big blue button gets pressed and everything starts whirring away again. 2015 has been a really good year, with hundreds of jobs going through, a load of fun comics to read, and lots of chances to see some incredibly talented creators doing their stuff. It’s been awesome – let’s do it again in 2016. 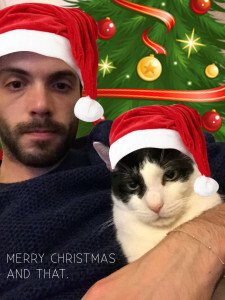 In the meantime, please enjoy this year’s edition of the crudely photoshopped corporate Christmas card (featuring Rich from customer services, who is me, and Mill, who is a cat and also head of accounts).